Why the 2018 Toyota Corolla? basic Toyota blah. Smooth ride but sloppy handling.Horrible steering! Electronic assist has "turbo lag". Even minor turns or curves require constant steering correction after. Certainly annoying after owning a Jetta. Smooth ride otherwise. Very good brakes. Good looking except for the "catfish" front end. Why???? Good driving position.Rear quarter visibilty for lane changes horrible as high and wide rear headrests blend in with C pillars and are not adjustible. Side view mirrors poorly shaped. Front seats are rather wide so little support. Automatic braking. Active cruise control used extensively. Lane departure warning. Rear camera. 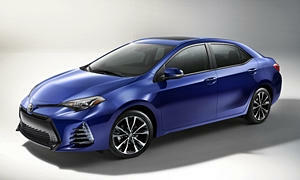 Why Not the 2018 Toyota Corolla? CVTs are noisy and the Corolla's is no exception when accellerating or decellerating. Otherwise quiet. Certainly does not have the zip of the Focus or Accent. Not much. Two compartment center console and door pocket cup/bottle pockets and one seat back pocket. Rear seat fold down armrest with cupholder takes out center seating position. No other storage. Glovebox does not lock. No place to lay a phone. Charger port does not retain power without key on. Roomy for a small car, flat floor. Drivers seat window controls too far back. Touch screen controls for radio and bluetooth require taking your eyes off the road for too long. Up/down buttons for climate controls again require you to look away to adjust. Good car if you don't mind the ugly front end and the annoying steering. Much better ride than the Focus but the Focus wins on zip. Trunk hinges take up a lot of room.